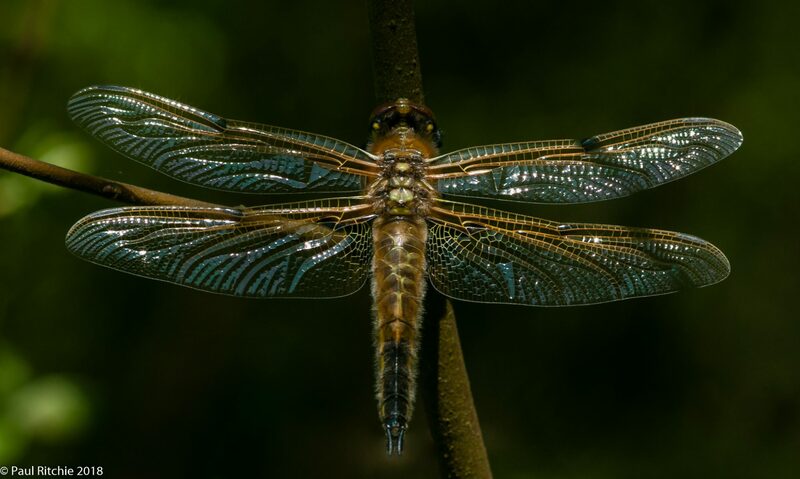 Remember that early Spring bounty when most species of dragonfly (and butterfly) emerged two to three weeks ahead of schedule? I remember cynically thinking at the time they’ve emerged early because they know it’s going to be a lousy summer. I wish I had been wrong. The weather changed from glorious sunshine to unpredictable and mostly miserable conditions. When the sun did appear it didn’t stay around long enough to maintain a decent temperature to provide those fabulous displays over water. I hadn’t been out on my own on my patch for a month partly due to a Scottish break and a bout of illness, but mostly because conditions weren’t favourable enough. I couldn’t just let the season fizzle out so decided to spend a few hours at Bramshill. I didn’t expect much but in choosing Bramshill with its mix of habitats I did expect to at least have some willing subjects to engage with. An initial scout around the ponds only produced a female Common Emerald and the odd Common or Ruddy Darter rising from the over-growth; conditions here have deteriorated enough to render the clearing almost impassable in dry conditions, let alone sodden. 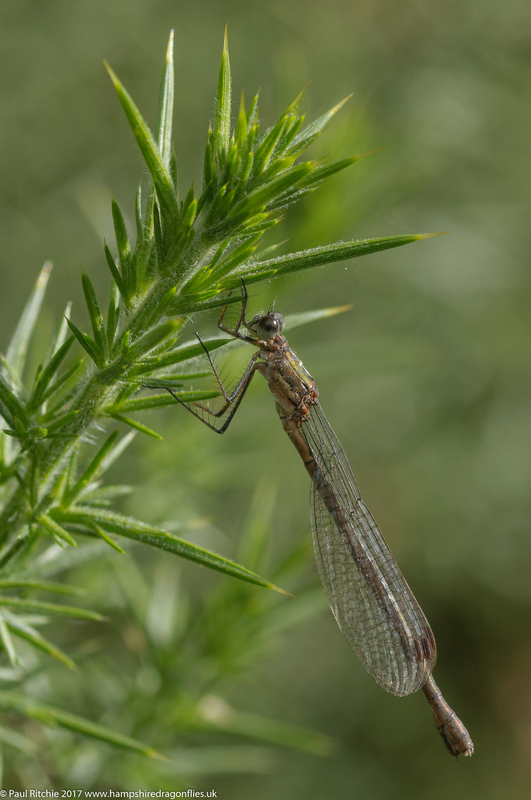 Hawker Alley didn’t show any hawkers or darters, just an occasional Common Blue damselfly; those once bountiful little pockets reclaimed by scrub. 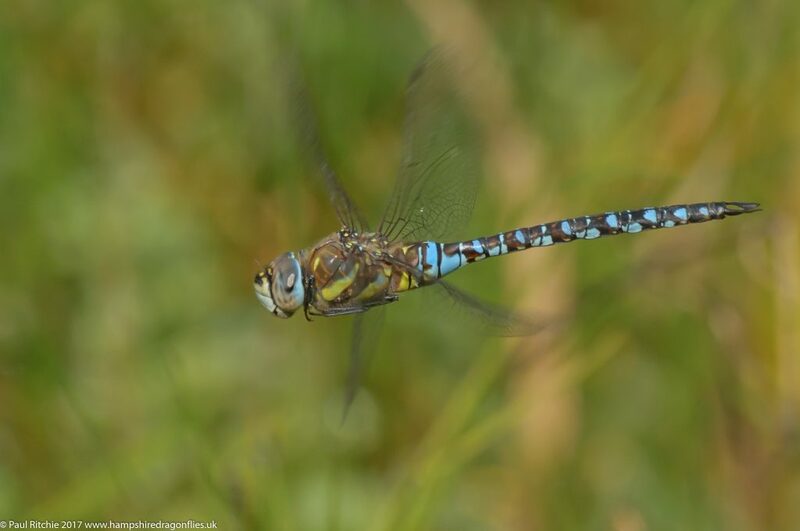 At the shoreline a couple of Migrant Hawkers brightened the outlook and I spent a quarter of an hour attempting to pin down one of the males. Passable, but I needed better. Unfortunately everything fell silent as the last light of the sun became obscured by a belt of sombre cloud, stealing all of the warmth from the air. 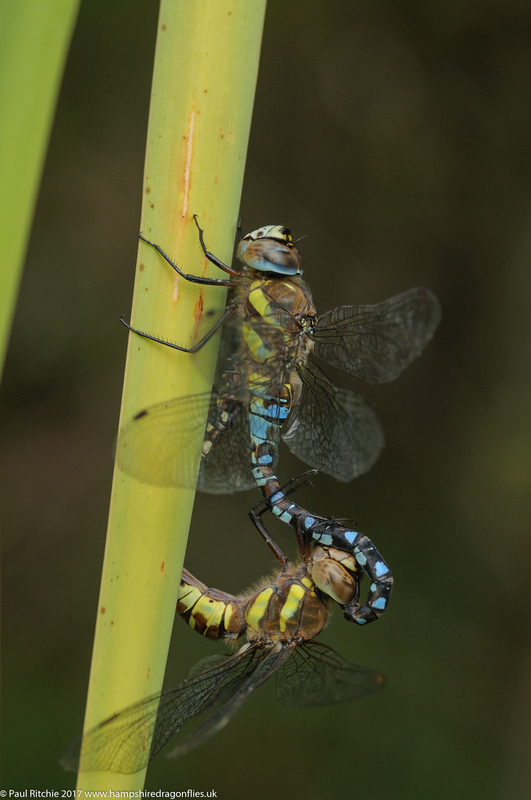 For 90 minutes I patiently waited for it’s return, the boredom occasionally relieved by a couple of tired Brown Hawkers, an ovipositing pair of Common Darters, a Ruddy choosing yours truly as a perch. One delightful moment when a Kingfisher came in, seemingly undisturbed by my presence as he grabbed something from the center of Long Lake before flitting back & forth along the far shore. At 2.00pm I took a walk back to the ponds to be greeted by less than earlier, walked around to the far back of Long Lake and returned to my favoured spot to find a pair of Migrants perched. Another hour of waiting ankle-deep for a subject to engage with before I’d had enough. 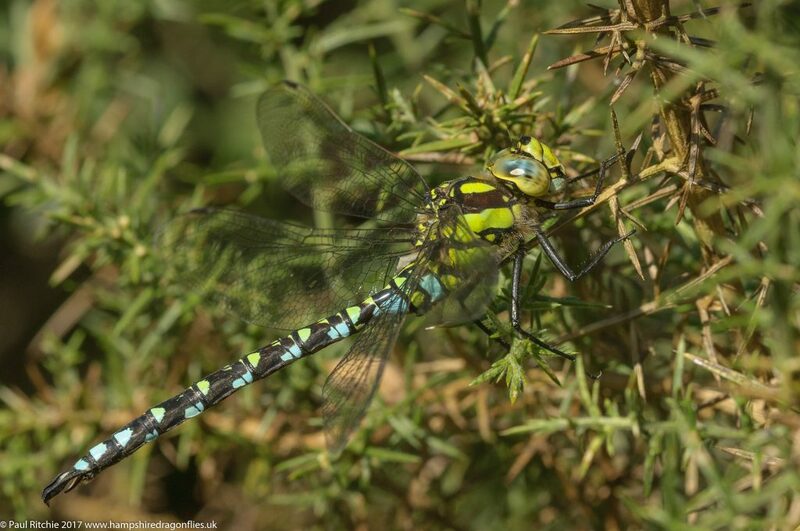 I decided to call in at the ponds one last time, relieved to find a Southern Hawker holed up in a gorse bush. 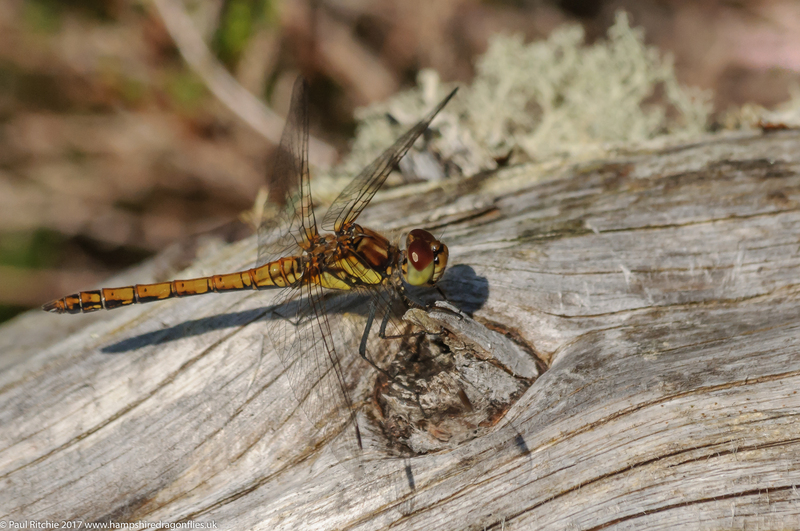 The lack of any other Southern sightings, the paucity of Common Darters and other expected species felt like mid-October rather than mid-September. Everywhere was overgrown and wet from a summer of seemingly endless showers. 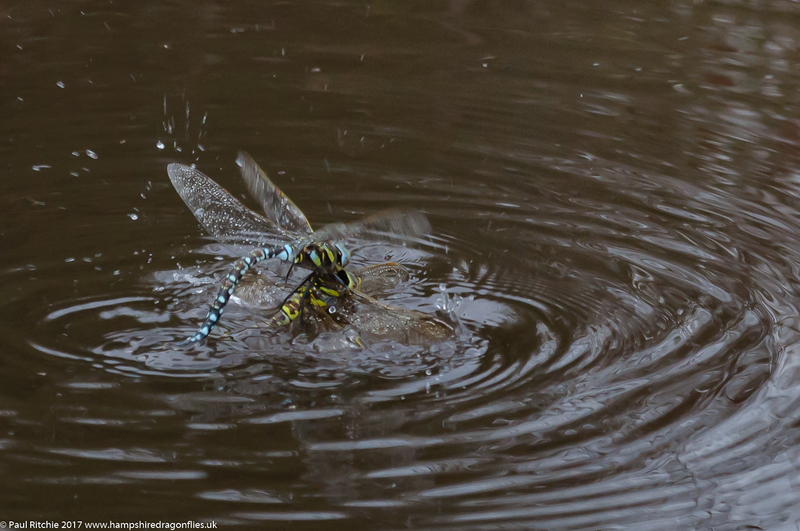 A day of pick ups with Aaron provided an excellent moment with a real favourite of mine; the Moorland Hawker. As if on cue my subject appeared from nowhere to do a few circuits of a small pond and as I waited for the right moment he found a female within the rush and, after a brief tussle, she flew off with him in pursuit. Shortly afterwards he returned to inspect the other end of the pond, guided by scent to another female perfectly hidden underneath the bank, which he grabbed and dunked before successfully latching on and flying off to the trees in the mating wheel. Having fallen in love with the Highlands in June we decided to grab a few days over the Bank Holiday weekend. 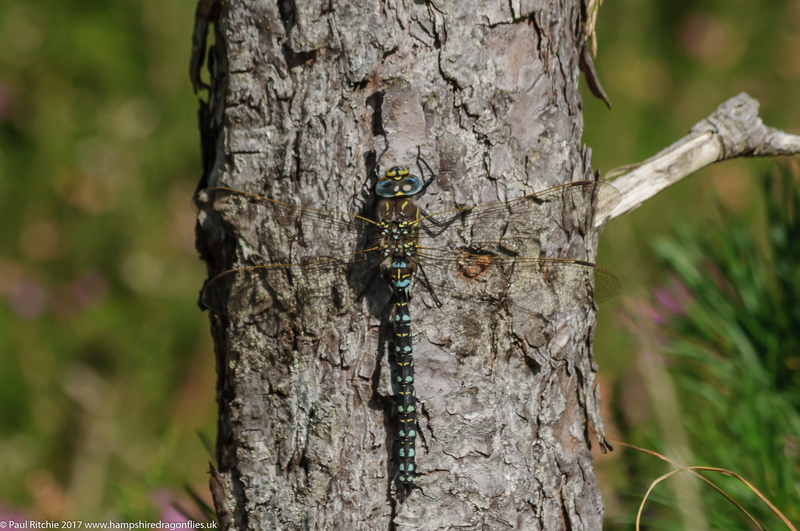 Although this wasn’t a dragonfly trip we couldn’t resist revisiting Laide Wood, and what a delight to experience this fabulous site without the driving wind encountered back in June. 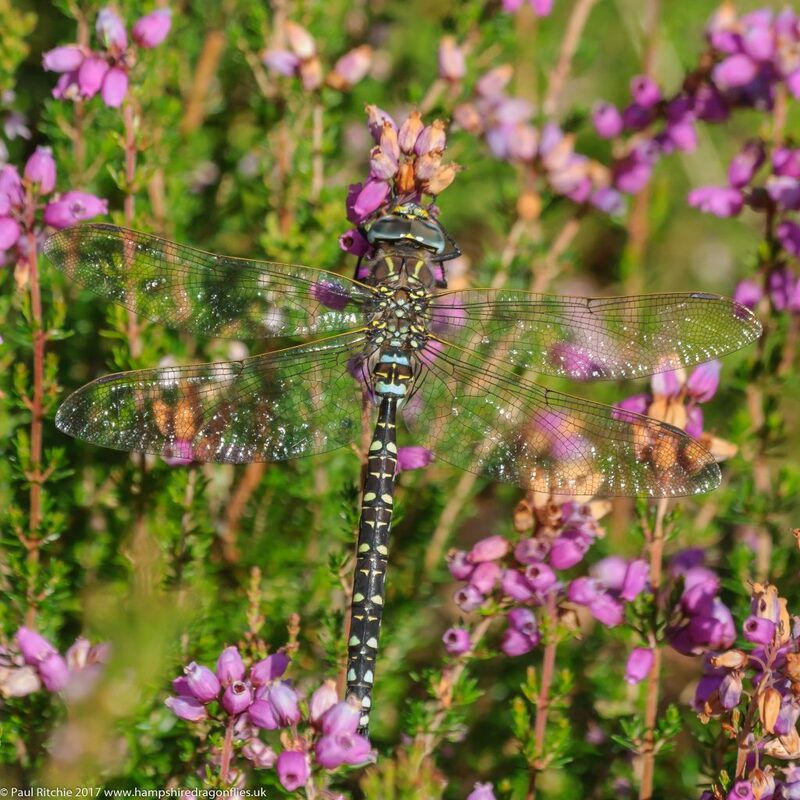 The path down was peppered with Highland and Black Darters while near the burn I had my first Moorland Hawker – a female – rise from the heather to pursue a Mountain Ringlet. Shortly afterwards a male landed path side on the heather allowing my first opportunity. The lochan on the edge of the woods with the hide needed a look, and both Darters were present around the shore, but we continued to Loch na Cathrach Duibhe where the open aspect and access is far superior. 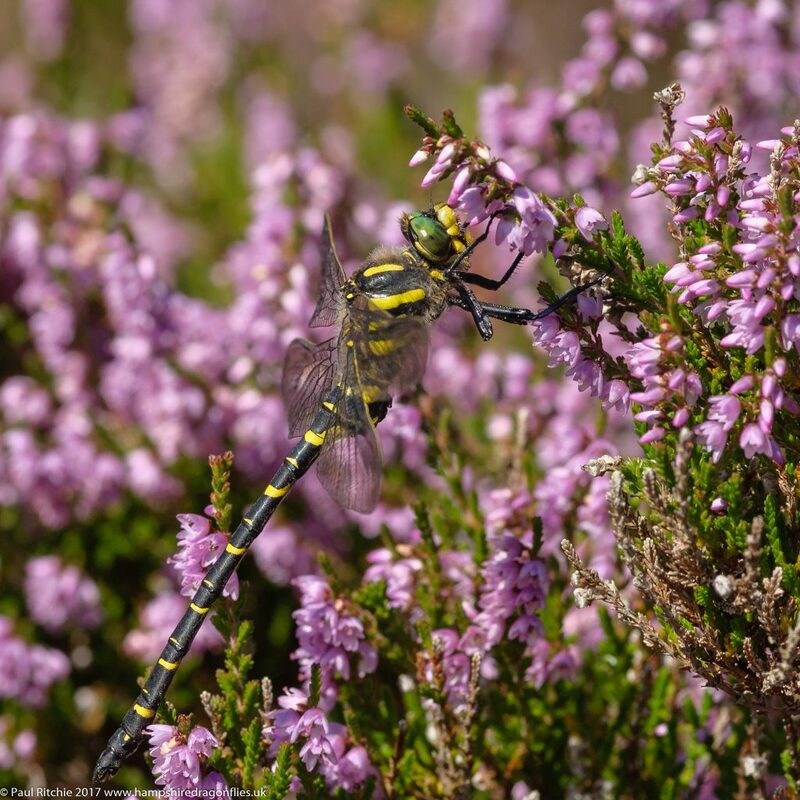 The sunny clearing was perfect for Moorland Hawkers coming in to feed either among the heather or around the trees. The shores produced several more Darters but we kept our eyes on the clearing, because you never knew what might fly in next. We took an alternative path back to reach another sunny clearing where we watched at least a dozen Moorland Hawkers feeding along the treeline and coming in to perch. 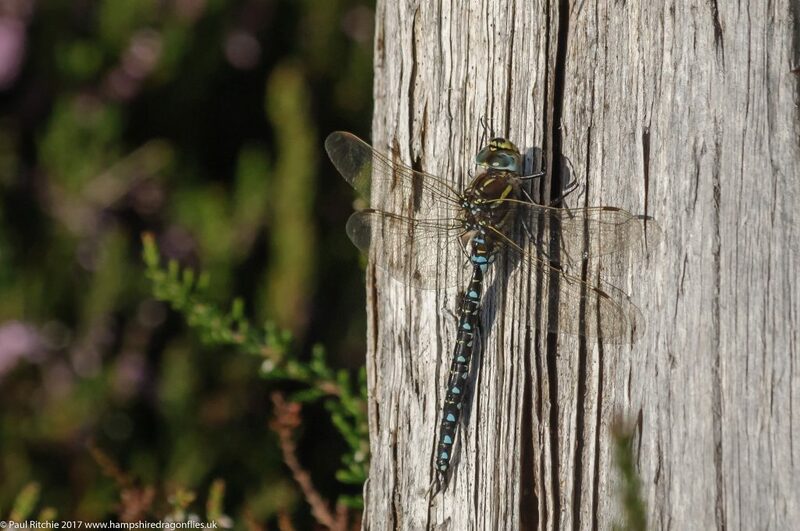 On our last visit we only saw female Highland Darters so were pleased to encounter several males, including an immature male taking the warmth from a convenient log. Up until now my go-to place for Moorlands had been Priddy Mineries in Somerset. After our visit today I feel I have a new favourite. Just a shame it’s more than a couple of hours away! Towards the tail end of our long drive to the Highlands I was determined to experience the famous Bealach na ba pass on the Applecross peninsula. After scaring Sue to death (she suffers from vertigo) we stopped so she could recover while I took in the view. To ease the drive down I pulled in to a parking spot halfway down. A short distance from the car park was a boggy pool. 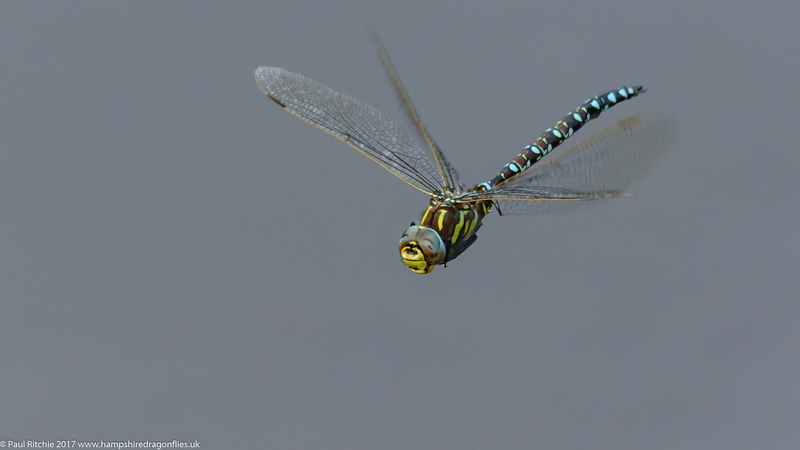 Flying low across the water was a large dragonfly which on closer inspection turned out to be an Emerald. Before I could grab the camera with the right lens attached he rose and flew across the mountain. Now being skeptical and no photo to scrutinise I passed it off as just a welcome encounter while we continued our journey. Two days later we took a walk up Flowerdale. On our way back down we had an Emerald flying along the trees feeding. Having done a little more research I can only assume these were indeed Northern Emerald (Somatochlora arctica) as it’s far too late for Downy and the Brilliant isn’t found this far north. Not bad for a supposed non-dragonfly break!